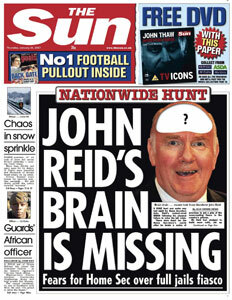 An absolutely classic front page greets readers of The Sun today, with the fantastic headline ‘John Reid’s brain is missing’. They claim that a nationwide search is underway for John Reid’s ‘walnut’ sized brain, as they are unhappy with the way the Home Secretary has dealt with the full jails fiasco – which can, of course, be added to a long list of Home Office fiascos from the last few weeks alone. This 1,047th post was filed under: Media, News and Comment, Politics.